The cry of “Content is King” has been a rallying call for bloggers and on-line publishers for years. Creating and marketing your content is now as easy as typing text and uploading images and videos and then hitting the publishing button. This has been facilitated by the advent of social networks and blogging software that facilitate fast efficient multi-media publishing. The reality is that everyone is now a publisher as social media has provided easy to use tools which has put a personal printing press in everyone’s hand. We are not only creating but sharing this content on desktops, laptops, ipads and smart phones to our Facebook and Twitter streams. The mobility of the smart phones has accelerated this publishing revolution that allows us to share anytime and anywhere as the impulse takes us. The more engaging the content whether it be video or text the more likely it is to be shared. In a knowledge economy the thirst for information and meaningful content is never ending. 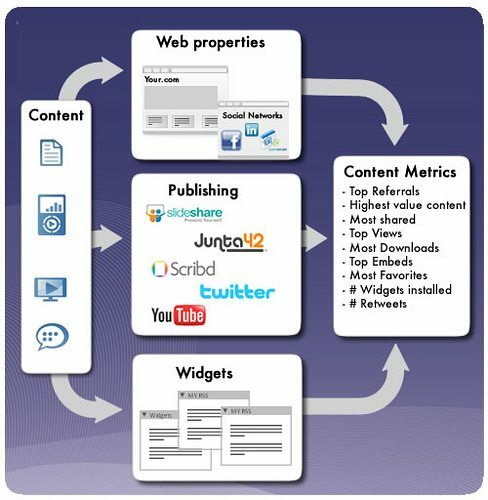 If you dig deeper into the term “social media” you will be reminded that content can be any type of media and format. Media in all its formats that was previously hidden on personal computers or buried in files offline can be published to a variety of social media platforms that host and make public your previously unpublished media. These include social media platforms such as Flickr for photos and images as well as Slideshare for presentations such as your last Powerpoint workshop. I often hear questions from new and aspiring bloggers about what should you publish and how do you find the inspiration for the content. It isn’t difficult if you start to let the imagination run free. What can you video and publish? Slideshare is the primary site to upload your presentations and with over 50 million monthly visitors and 90 million pageviews it now ranks as one of the top 250 websites in the world. It also supports document sharing. Also make sure that the presentations and PDF’s are well structured for scanning and skimming with good headings and subtitles. King of image uploading is Flickr but other platforms to consider is Google’s Picasa (now included in Google+) and of course Facebook. High definition images that are well produced can provide high engagement. Text content is one of the oldest of formats since the pen and pencil was invented but still maintains its importance as a primary publishing medium. What are some highly engaging text formats that help you sell your products and services? Case Studies – Customer and readers love case studies that validate strategies and tactics. They are typically 1-2 pages long and with the narrative structure of the a story and are based upon real life events. This list is not exhaustive but will provide you with some tips that will maybe inspire you to engage in many media types that communicate with your readers , prospects and customers. Sometimes bundling a range of formats for the same information will allow you to reach a broader audience that a singular media type cannot.